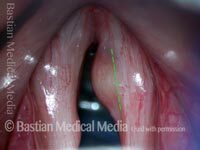 A cyst that forms when one of the mucus glands just below the vocal cord’s free margin becomes plugged. Mucus glands in this location secrete mucus in order to bathe and lubricate the vocal cords, but if a gland becomes obstructed, then the mucus it produces gets trapped and accumulates, leading to a mucus retention cyst. A mucus retention cyst typically occurs without any correlation to vocal overuse, in contrast to epidermoid cysts as well as nodules and polyps. A mucus retention cyst can cause hoarseness, because it interferes with the normal vibrations of the vocal cords and the accuracy of their match with each other (see the videos below). The cyst is most often unilateral—that is, occurring on one cord but not the other. It appears as a bulge or deformation of the vocal cord’s free margin, and sometimes undersurface, and it may be yellowish in color. The cyst may be surgically removed, by creating a small incision on the vocal cord and then dissecting the cyst from the cord. 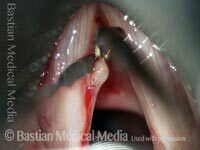 Photos of the surgical process can be found below. 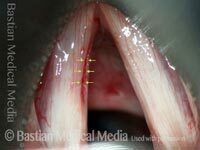 Also, the two videos below show how removing this kind of cyst can improve the voice. 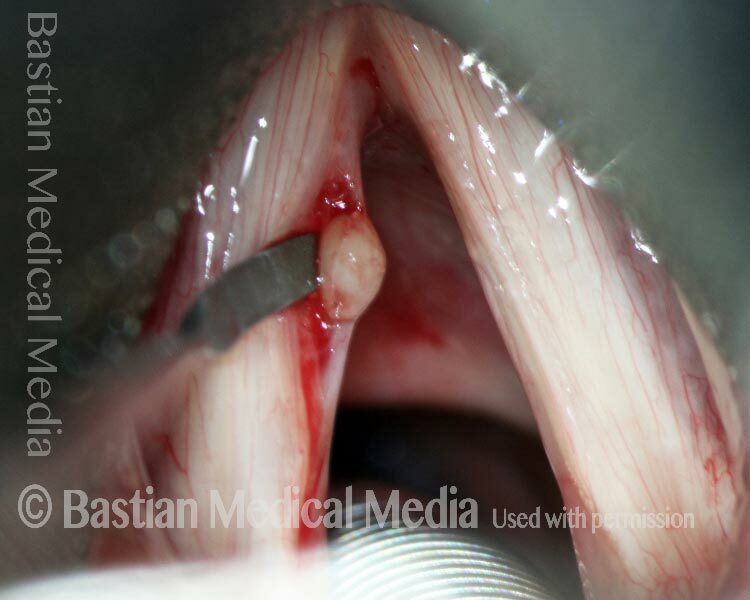 Mucus retention cyst of right vocal cord. Yellowish spherical mass shines through overlying mucosa. This was causing the patient severe hoarseness. 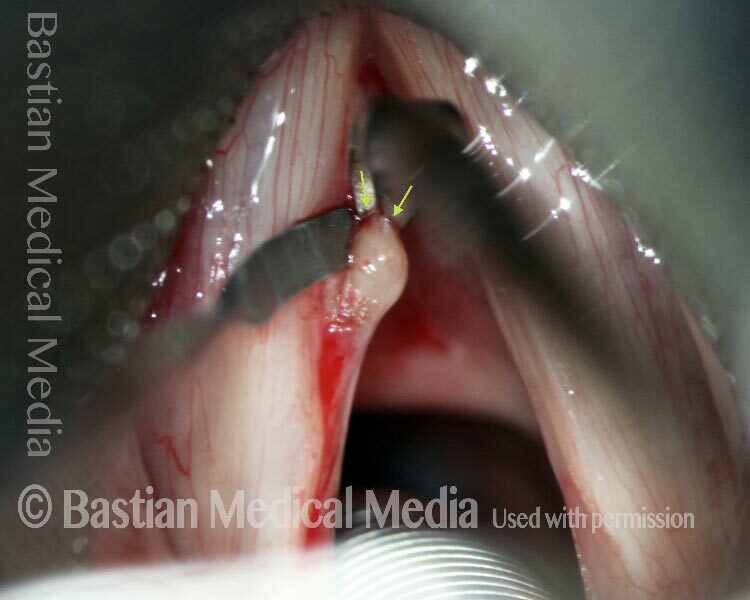 Incision to enter the cord at dotted line. Near completion of dissection of cyst from its final attachments, using curved scissors. After cyst’s removal. The patient’s voice sounded virtually normal in the recovery room, though upper voice still abnormal. The physician injects xylocaine with epinephrine into the tissue before surgery, so as to inhibit bleeding and to cause some of the layers of tissue to expand and spread apart (hydrodissection). The hydrodissection effect of the injection is now visible. The incision has been made. Now, curved scissors (pointing downward) release the cyst’s anterior attachment. 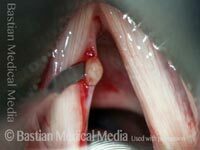 The cyst is now almost fully released from the vocal cord. Removal completed. The line of incision is visible. 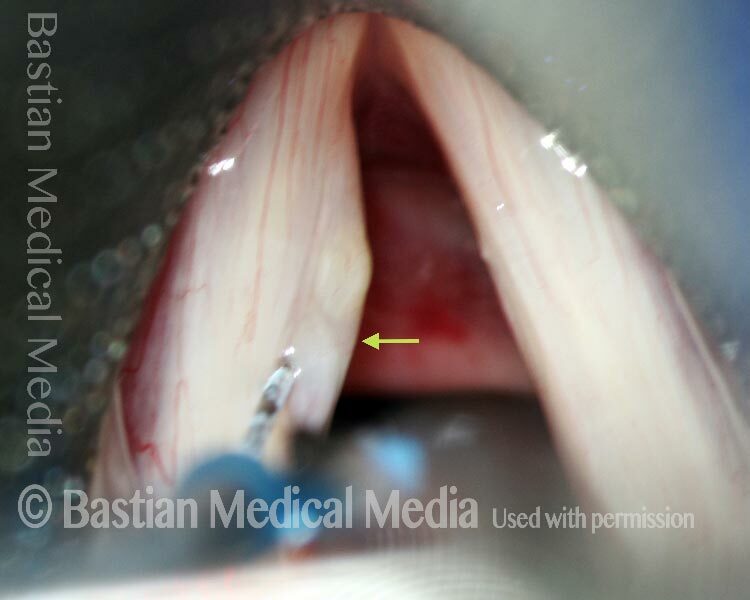 After laser excision of early vocal cord cancer, left vocal cord (right of image), a small mucus gland became plugged. This could instead be mistaken as a polyp, but a polyp does not fit this man's quiet nature and minimal vocal commitments. Note that the lesion is below the point of maximum vibratory contact that would produce a polyp. This man's voice is excellent. This person has chronic hoarseness, without prior illness or voice overuse. 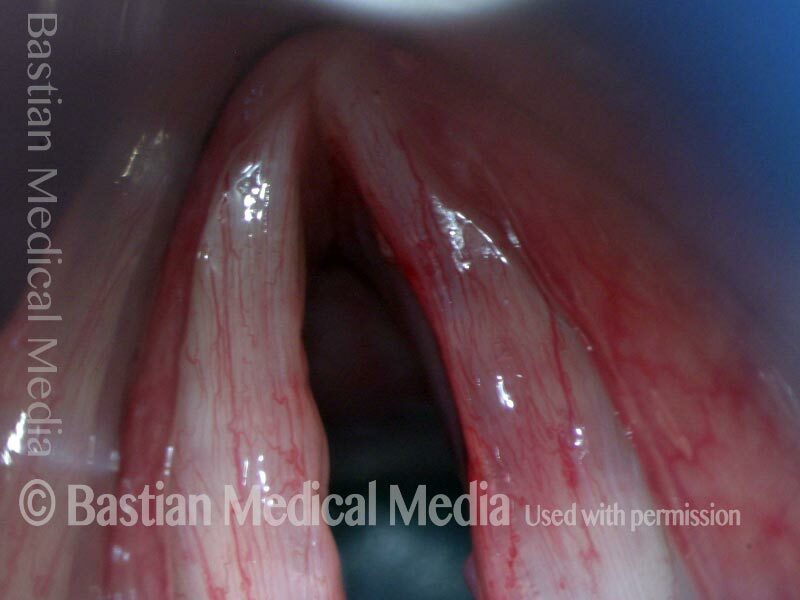 The explanation is this left-sided mucus-retention cyst (right of photo). 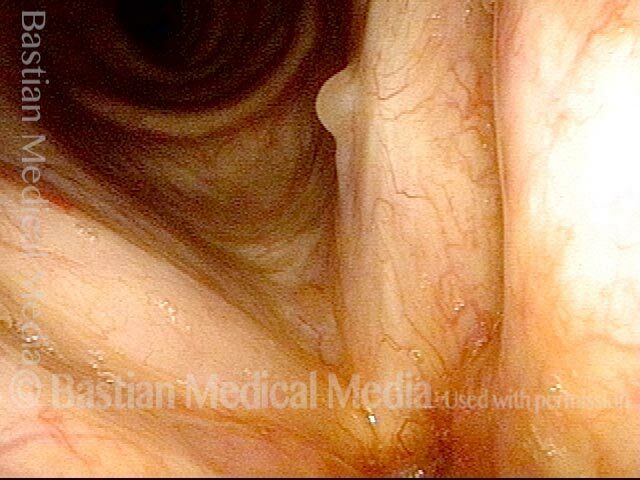 The next photo shows more clearly how we know this is a cyst and not a polyp. This photo is under a strobe light during the open phase of vibration and dotted line shows the free margin of the cord. 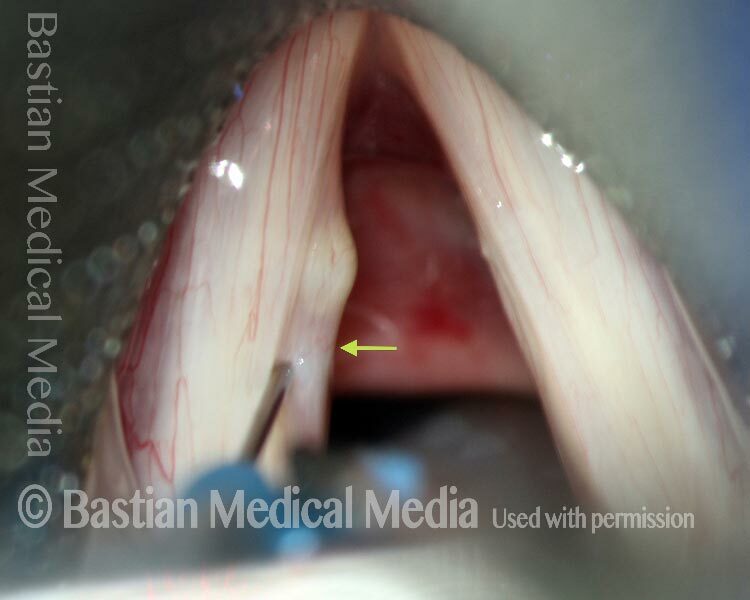 It shows that the swelling originates from below this free margin, common for mucus-retention cysts. The two solid lines show the incision line options for planned dissection and removal of this cyst. 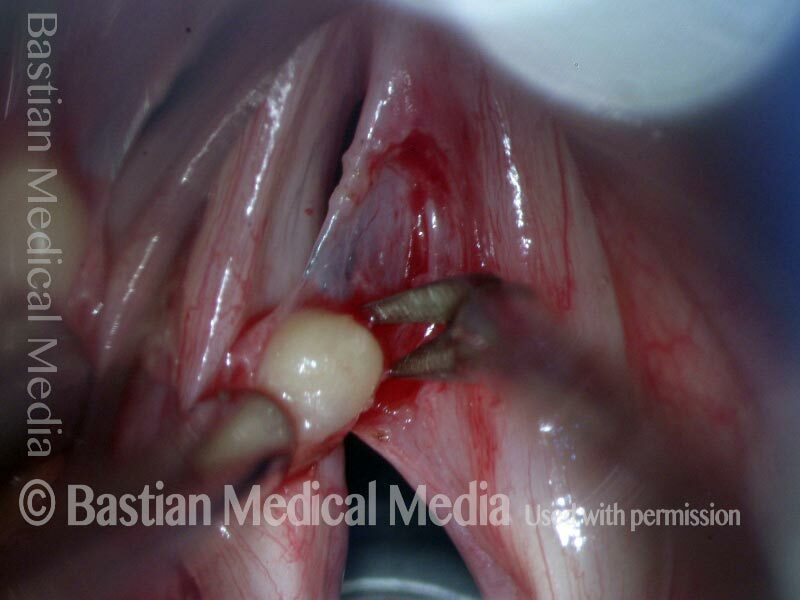 Here the medial one (on the cyst) was chosen, as seen in the next photo. A week after incision and dissection and removal of the cyst. You can see the incision line at the dotted line. Closed phase of vibration at E5 shows perfect match of the margins. 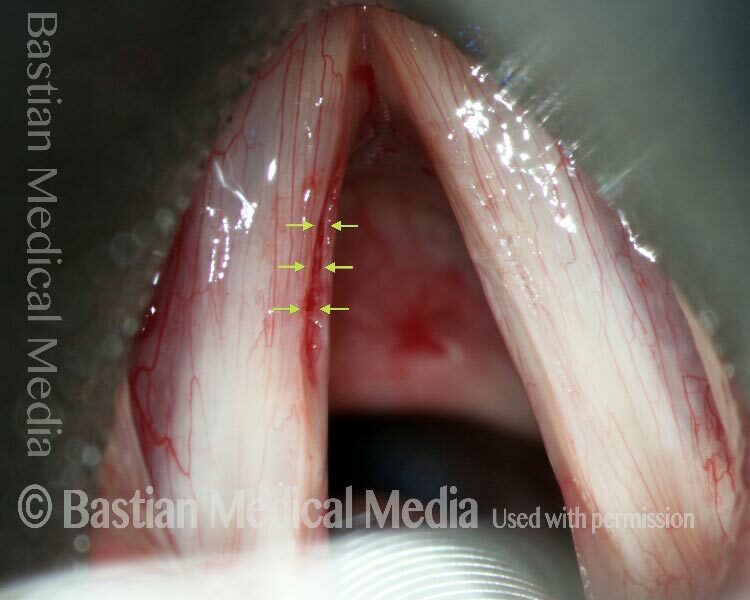 Open phase of vibration at same pitch shows that both cords make lateral excursions, confirming lack of stiffness and scarring due to the incision and dissection being below most of the vibrating part of the mucosa. 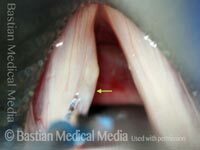 Watch this video to see images and hear audio of a mucus retention cyst’s effect on the vocal cords, followed by the surgical removal and the post-surgical results. This entry was posted in Multimedia Encyclopedia and tagged Disorders, Other benign mucosal lesions, Photos, Videos, Voice & other larynx disorders by admin. Bookmark the permalink.